Childhood obesity is a problem, no doubt, but there has got to be a better way than subjecting toddlers to weight loss surgery. Unfortunately, that’s happening as young as the age of 2 now, and it’s heartbreaking and outrageous that it is. 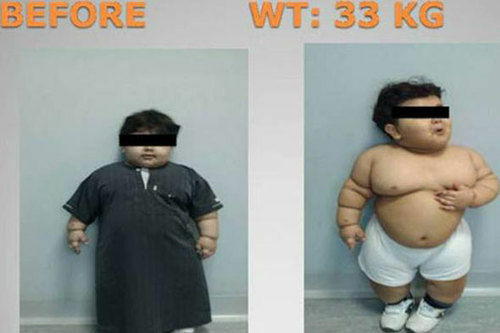 A boy in Saudi Arabia has become theworld’s youngest weight loss surgery patient. According to news.com.au, the boy had a body mass index of 44.1 before the surgery, putting him well over the healthy range of 18.5 to 24.9. Doctors say he wasn’t suffering from any “hereditary or genetic causes of obesity,”but his weight was causing other physical problems such as sleep apnea. Cleary something needed to be done, and his parents reportedly tried two attempts at dieting. One at 14 months, according to the New York Post, resulted in a 17-pound weight gain, but it’s not known whether they stuck to the diet after that. When the boy hit 72 pounds, his family and doctors decided surgery was the answer. It did work. He was followed for two years after the surgery, and doctors reported that his BMI went down to 24. So that’s great, but the extreme method — which comes with its own risks (both known and unknown) — is just disturbing. He was just 2 –that’s before many children learn to talk, or skip, or even use the potty. Did they just give up on teaching him how to eat healthy and exercise? I’m sure they thought they were doing it to help him lead a healthy life, but they simply could not have exhausted all the means do so naturally by the time he was 2. Sadly, he’s not the first toddler to undergo the surgery either. There are reports of a 5-year-old boy from Saudi Arabia and a 4-year-old from India who have also undergone the surgery. I fear we’re going to see more and more cases too. The results suggest that LSG (laparoscopic sleeve gastrectomy) can be a safe and effective alternative for weight control in morbidly obese children even of less than 3 years of age. However more studies and long-term follow up is essential for monitoring the growth and development of children subjected to LSG. Really? A safe and effective alternative?! Are we really going to allow parents to take the easy wayand put their children at risk by putting them under the knife instead of trying to instill healthy habits? We simply can’t give up that early. What an awful event. For the parents to make such a choice is really sad. Couldn’t the family lose weight together?